With the aim of strengthening international cooperation in science, technology and innovation activities, the Plastic and Rubber Training and Research Institute – ICIPC -, the German Fraunhofer Institute FIT (Institute of Applied Information Technologies), Colciencias and the Corporation Route N, announce the launch of the joint research platform SPIRIT (Sustainable Plastic Materials, Processes and related IoT – Internet of Things). All this within the framework of an international cooperation agreement to contribute to the science and technology ecosystem, which will respond to important needs in the areas of sustainable polymeric materials and products, sustainable agriculture and food, sustainable health and IoT platforms (Internet of Things) that support the circular economy. This project, which becomes a reality in 2018, aims to generate and strengthen the transfer of knowledge between both institutions, as well as carry out applied and innovative research in the areas of sustainable polymeric materials and products, sustainable agriculture and food, sustainable health and IoT platforms ( Internet of things) that support the circular economy. Combining the global technologies of the Fraunhofer FIT and those of the ICIPC, in the themes of the SPIRIT platform, research, technological development and innovation projects will be generated and carried out to proactively respond to the needs of the industry and academia. This cooperation agreement will be established following the Fraunhofer model. This model consists of covering the financing of the projects with funds from the public sector of regional or national order, competing funds or public calls and direct contributions from the industry. 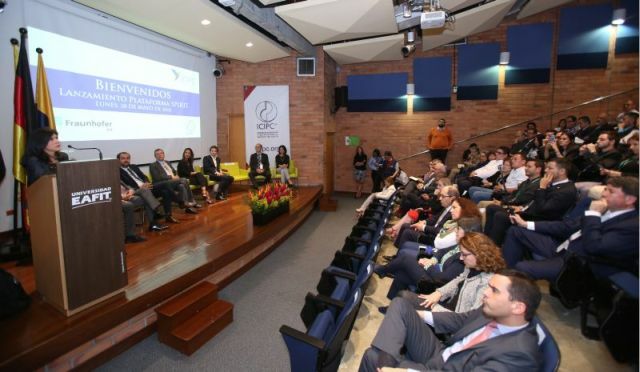 Colciencias, Ruta N, Universidad EAFIT and Acoplásticos support this international cooperation agreement as part of its commitment to leverage the capabilities of technological development centers and research institutes through partnerships with world-class international institutes. There are only two Fraunhofer project centers in South America, one in Brazil and another in Chile. The SPIRIT joint research platform becomes a focal point for the acquisition of R & D projects from ICIPC and Fraunhofer FIT. It is the largest applied research organization in Europe, made up of more than 65 institutes and research centers (distributed throughout Germany, Europe, the Americas, Asia, Africa and Oceania) in topics such as health, energy, security, communication, industrial production , transport and mobility, environment, among others. It has more than 24,000 employees, most of them with high-level academic education in natural sciences and engineering. It is dedicated to applied research, according to the needs of the industry, both for private and public companies and for society in general. Its annual budget reaches 2,000 million euros, of which approximately 1,200 (60%) come from research by contract, financed by the industry. This scheme of financing its budget through contracts with the industry has had great international resonance and is known as the Fraunhofer Model. The principle of action of these institutes is to carry out research dedicated to the future. Fraunhofer investigates according to the needs of the industry but based on scientific and technical excellence.